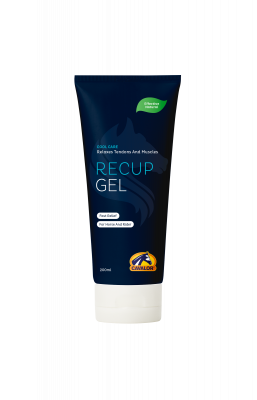 Cavalor Recup Gel, formerly known as Muscooler, can be used all over but is especially useful for treating the tendons and muscles in Equine limbs and along their backs, after intensive exercise. This cooling gel contains natural products with added plant extracts, which have a stimulating effect on the circulation. It works to cool and relax taut muscles and tendons, reducing stiffness and aiding recovery. Massage the affected area with a thin layer of Cavalor® Recup Gel after workout for a well deserved cooling effect, which will help to prevent muscle stiffness the next day. Bandages can be safely used in combination with Cavalor® Recup Gel. Cavalor states it does not contain camphor or any ingredients that are prohibited in competitive sports.